Sorry for the folks who are not interested in the US election... Here are some thoughts that I felt compelled to put in writing. A provocative headline aimed at the liberals read “You would vote for a liberal Donald Trump”. Would I? After reading the arguments of Scott Alexander's Slate Star Codex – which I urge you to read through – I wouldn’t: I would vote for a right-wing, neo-con, “crooked” Hillary Clinton who is experienced and predictable and respects the basic tenets of democracy if she faced a narcissistic, unstable con artist with no respect for democracy seeking self-aggrandizement - however liberal he claimed to be to get elected. Because partisan issues can be delayed by four years but damage done to democracy takes a generation to undo. 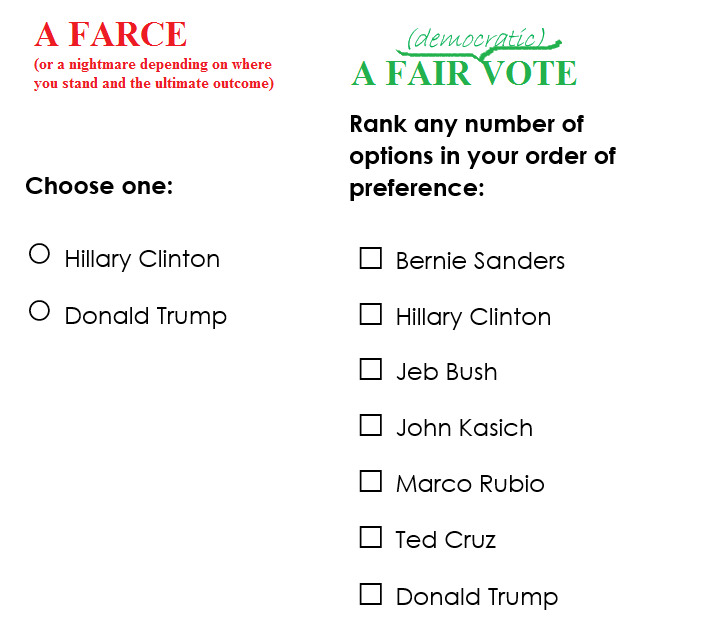 People say that the candidates are flawed, but it's the *election process* which is flawed. 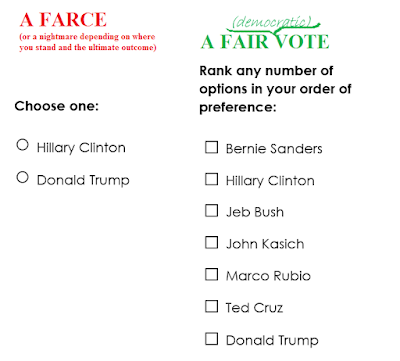 The easiest and most required reform in my opinion is some kind of ranked choice voting, like advocated by FairVote and, in the case of the presidential election, abolishing or reforming the Electoral College. I understand those who feel they have been given the choice between the least of two evils in this election. Look at the image below, wouldn’t the right-hand side feel like a dream in today’s context? The US needs many things. It needs universal health care, it needs improved infrastructure and quality of life, it needs a way to include unskilled workers in the economy of the 21st century, it needs to cope with global warming, and it needs spiritual healing. The partisan rift and constant feud is crippling government – even often shutting it down entirely. I don’t expect Hillary Clinton to bring spiritual healing if Barack Obama couldn’t make the situation any better despite his good intentions to reach out to Republicans and increase bipartisanship. I hope Hillary Clinton wins and tackles the other challenges with talent and I will contribute now to electoral reform advocacy.